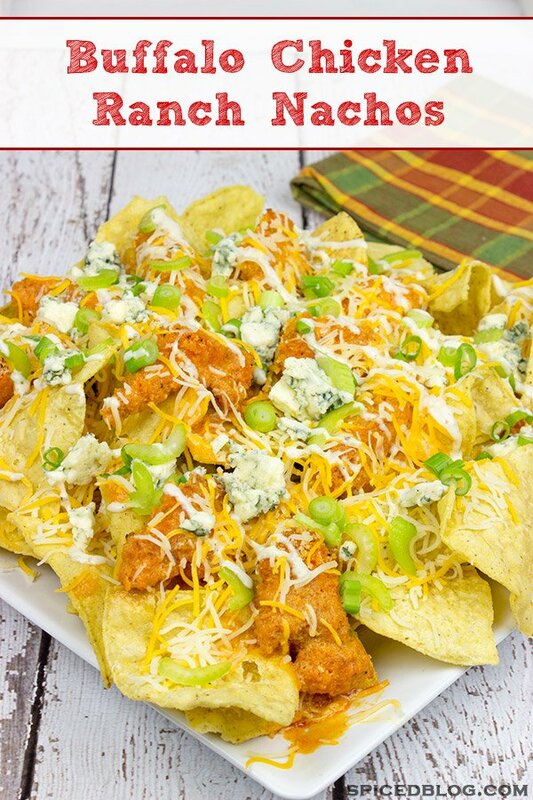 These Buffalo Chicken Ranch Nachos feature everything you love about buffalo wings…just in nacho form! They’re the perfect appetizer for the big game! Well, here we are. Another year is almost in the books. That means the college football season is wrapping up…but it also means the best bowl games are yet to come! And of course, the pro football playoffs are right around the corner, too. January can be a depressing month. The holidays are over, and the weather outside is frightful. (Can you tell I’ve been listening to a lot of holiday tunes lately?) But that’s where football–and delicious football food–comes in. 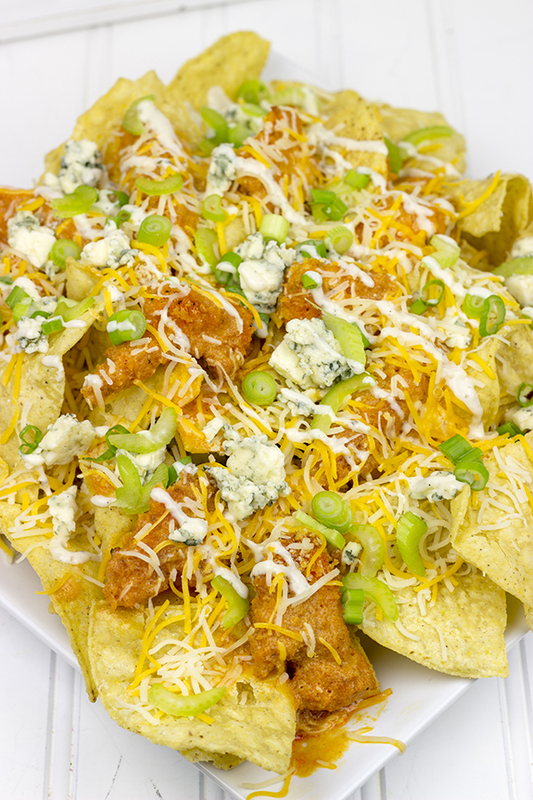 Say hello to these Buffalo Chicken Ranch Nachos. 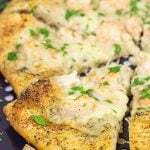 They’re one of my favorite gameday appetizers, and they totally need to make an appearance in your kitchen soon! 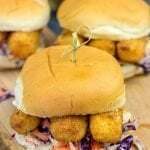 A couple of weeks ago, I came across a list of best stadium foods. Just reading the list made me want to get in the car and go on a tour of stadiums around the country. But I’m not sure I could convince my wife of this value of this trip. (“But it’s for work! 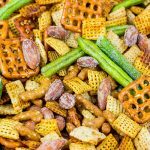 I’m researching the best tailgating and stadium foods in the country.”) While I may not be hitting the road anytime soon, I can tell you that I plan on whipping up some awesome homegating recipes every weekend in January. Who’s with me here? The awesome late-season football helps me get through the many, many inches of snow that are certainly coming my way. Not surprisingly, buffalo wings ranked up there near the top of the list for best stadium foods. I mean, football just isn’t the same without buffalo wings, right? But here’s the thing. Buffalo wings are messy to eat. 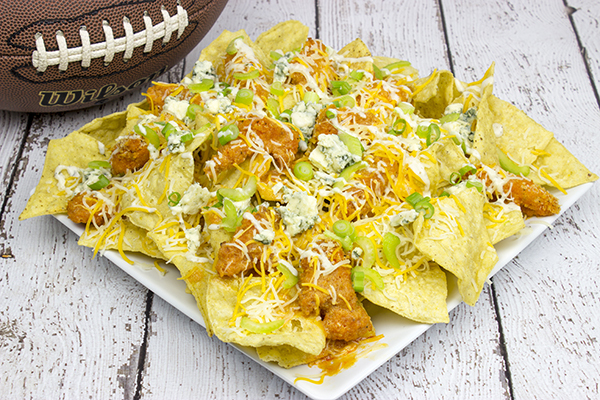 Nachos are also highly ranked on the list of favorite football foods, and nachos are much easier to eat. Therefore, I propose that we combine these two favorites to create an awesomely delicious appetizer! Buffalo Chicken Ranch Nachos. These bad boys feature all of your favorite flavors from buffalo wings…just in nacho form. Do you get together with friends to watch playoff football? Or perhaps you just watch the games with your family instead? Here’s to an awesome season of playoff football and fun parties at home! 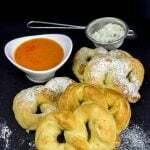 Looking for some more tasty Super Bowl foods? Check out these favorites, too! 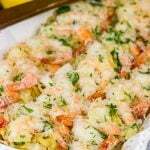 In a medium bowl, combine the bread crumbs, paprika, salt and pepper. Toss the chicken strips in this mixture until well coated. Pour the melted butter into a shallow baking dish, and then place the coated chicken strips into dish. 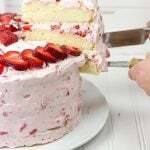 Bake at 400°F for 35 minutes, or until fully cooked. Using a small saucepan, whisk together the hot sauce, corn starch and brown mustard. Add the remaining ingredients (butter, vinegar, Worchestershire sauce and garlic power). Heat until butter has melted and sauce just begins to simmer. Whisk together until well combined and then remove from heat. In a medium bowl, toss baked chicken with the buffalo sauce until well coated. Place the tortilla chips on a large oven-safe platter and sprinkle the shredded cheese around the top of the chips. Place platter under a broiler for 2-3 minutes, or until cheese has just melted. 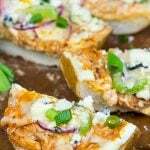 Remove platter from the oven and top with the baked Buffalo chicken, sliced celery, crumbled blue cheese and green onions. Finally, drizzle top of nachos with ranch dressing and remaining Buffalo Sauce (optional) before serving.